And Then There Were None is the best thriller novel of all time. It was written by none other than the queen of thriller Agatha Christie. This Harper Collins published book is a suspense novel in which you remain puzzled till the end about identity of the killer. Cover : The cover of the paperback which I have read was ordinary and didn't excite me at all but I have also seen some other edition's cover which were more interesting and intriguing. Content : Ten people from different places belonging to different backgrounds and who were totally strangers to each other were lured to come on Soldiers Island on invitation from Mrs and Mr U.N.Owen. Each one ranging from a judge to a doctor from a police constable to a military general, a governess and others were tempted on island on promise of either summer holidays or meeting old friends, a job and things like that. These eight people along with two servants were unaware of whereabouts of their hosts Mrs. and Mr. Owen. On reaching this island they received a message through a gramophone player about some crimes related to their pasts. Each one of them was accused with murders of someone and the voice in the gramophone warned them of dire consequences. They all get frightened to hear this gramophone record and it was a then first death happened. As the time passed each one of them died according to an old nursery rhyme 'Ten Little Soldiers'. After four deaths when they found that they were the only inhabitant of this island they realized that one of them was a killer, they started doubting each other but killings didn't stop and one by one they all died till there were none. Comment : First of all I must stand up and clap for conceptualize this story. It was difficult to write such a book and Agatha Christie herself regarded this book as her difficult book ever. The suspense starts right from the first page with the mention of story about the ownership of the Soldiers Island later the plot thickens and tightly took you into its grip and then you left with only one option to finish it quickly. There was no single dull moment in this book. Some may find it difficult to understand for interwoven plots but with the flow of the narration all things seems clear and understandable. I finished reading it in two nights (3 hours each night). The killer is not guessable till the last page. A letter in the epilogue open the lid of suspense from the plot which bold over your imagination. A superb thriller with suspense story, gripping narration and an out of the box revelation. Verdict : If you loves thriller then what are you waiting for? Go grab your copy today. Rating : I would give it 5/5. I read it many years back. I had Agatha fever at that time. She was the queen of thriller. Enjoyed every book. This is a classic. The book has another title "Ten Little Niggers" after the rhyme. Perhaps the latest publication has replaced the word Niggers with soldiers for obvious reasons. It is difficult to review Agatha Christie. Your efforts to that effect is quite courageous. This thriller was also adapted for a movie by the same name. Incidentally, the old Hindi classic 'Gumnaam' is also based on this book. 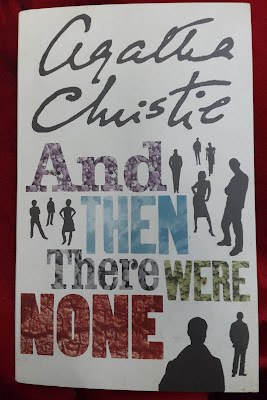 Have read other books of Agatha Christie, but not this one. You have brought a classic to the readers. It really sounds thriller by the name itself and your review is great!